Tamaño de esta previsualización: 756 × 600 píxeles. Otras resoluciones: 303 × 240 píxeles · 605 × 480 píxeles · 969 × 768 píxeles · 1280 × 1015 píxeles · 3000 × 2379 píxeles. F-104G (N826NA) in flight over the Mojave Desert in January 1988. This F-104G was build in 1964 from FOKKER (Netherlands), member of "ARGE NORD" with S/N 8213 as version "RF-104G" for the German Air Force (Luftwaffe), Maiden flight was January 30. in 1964 codes as "KG+313" (KG=Fokker); In the LUFTWAFFE as EB+114 in AG52. Since 1967 under marks "24+64" iin WaSLw10. Modified to AWX-Standard (AWX= All weather interceptor) in 1971. Since 1971 in MFG1 (Marineflieger, German Navy Fighter). Sold in 1975 to NASA for aeronautical experiments at Dryden Flight Research Center, Edwards AFB, California. Last NASA flight February 3. 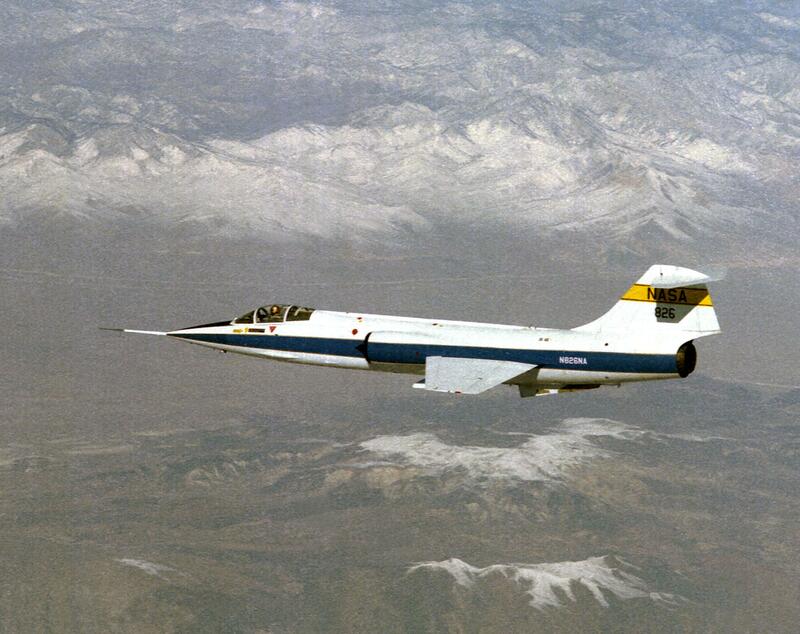 1994 as last NASA F-104. Preserved at Dryden Flight Research Center, Edwards, California from July 1995 on display at NASA Dryden Flight Research Facility in Visitor Center, Edwards, California (USA).